A fish tank is an excellent source of entertainment and a beautiful addition to any home. A 10 gallon fish tank is the perfect size – large enough to house many different, colorful fish, but small enough to be economical and easy to maintain. In this review, we reveal our 5 best 10 gallon fish tanks that offer the best value and quality. The best performers in our review are the Marina LED aquarium kit, the Aqueon LED aquarium kit and the Penn Plax aquarium kit. 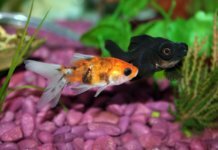 Here’s more information on choosing the right Betta fish tank for you, along with a detailed review for each product we chose. 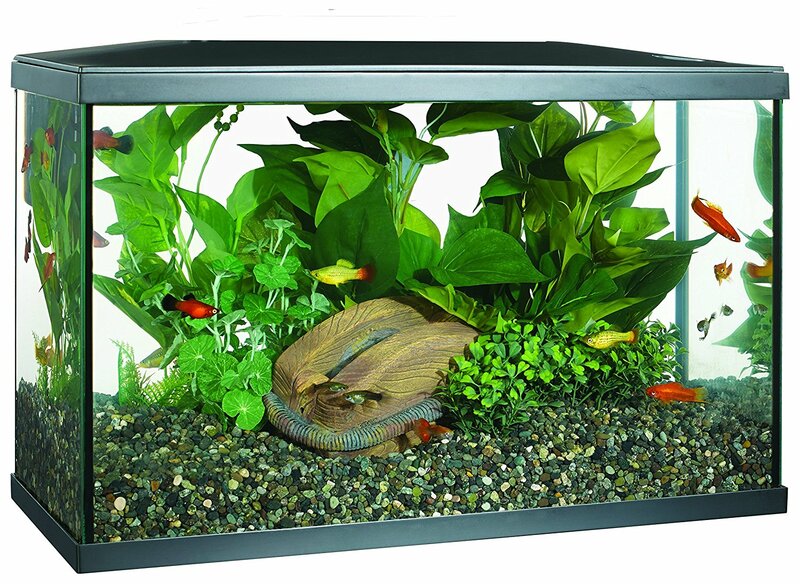 Aquarium filters, lighting, air pumps, heaters – many of these are essential for a healthy tank. 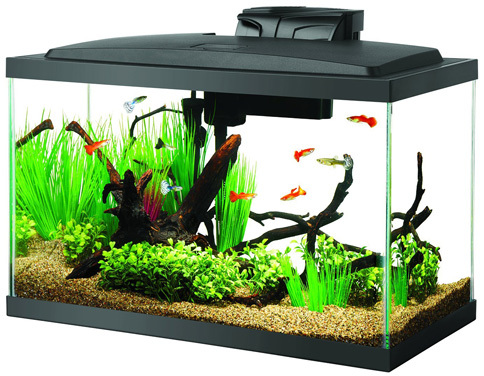 Many fish tanks for sale are kits, and come with all the necessary supplies already included; however, their quality can vary. Some are absolutely useless, and will need to replaced immediately. We evaluated the quality of included equipment when reviewing our 5 best aquariums. Some freshwater fish, like Neon Tetras, prefer a wider fish tank that allows some swimming space. Other fish won’t mind a taller aquarium. Seeing as a 10 gallon aquarium is often the bare minimum for many types of fish, the dimensions matter. A longer fish tank usually opens up more stocking options. Nobody wants to end up with 10 gallons of water on the floor. Every aquarium absolutely has to be safe, sturdy, and well-constructed, as even the smallest fault in design can lead to a catastrophe. Because of this, we focused on well-made fish tanks from reliable brands. We liked: Fish tank filter and lighting included. 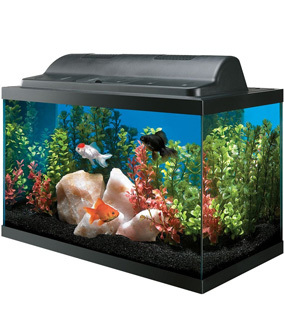 Our best value 10 gallon fish tank, and a good choice if you’re on a budget but still want to get the full package. 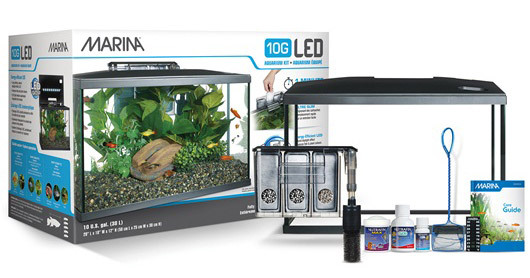 It includes everything you need to get started; a filter and LED lighting, along with fish food, a water conditioner, and an aquarium care guide. The slim clip-on filter is a nice addition; it’s unobtrusive, relatively silent, and easy to maintain. The lighting is modest, but still ensures a nice, clear view of your aquarium. The Marina Aquarium Kit is 20″ long and 12.5″ tall, allowing plenty of swimming space for various shoaling fish and easy access when it’s time for maintenance. We liked: Fish tank filter, heater and lighting included. We didn’t like: Heater temperature not adjustable. 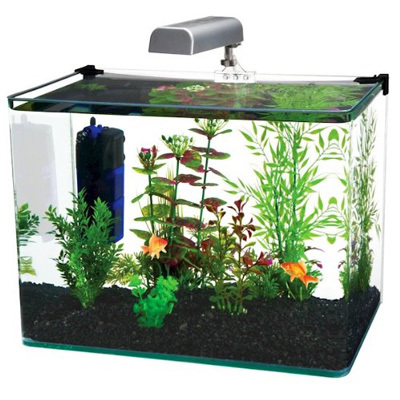 Similarly to the Marina 10 Gallon Kit, this small fish tank comes with almost everything – a decent filter, LED lights, and a heater are all included. It’s an excellent option for beginners, as it comes with a number of features to make maintenance more simple and error-free. The filter will flash when it’s time for maintenance, and the heater automatically keeps the water temperature at a steady 78 degrees. Although limiting, this isn’t so bad. Most fish that can live in a 10 gallon tank will love this temperature. 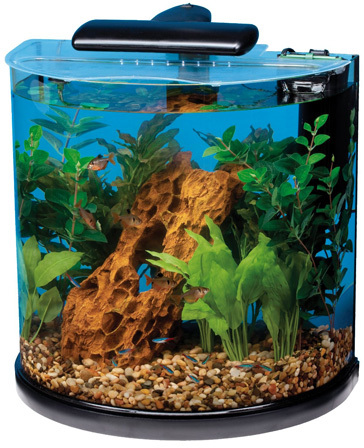 All in all, this Aqueon aquarium kit is an excellent choice if you’re new to the hobby. It can serve as a Betta fish tank, or a colorful tiny community tank. For fish lovers that want something slightly bigger, Aqueon also produces a very similar line of 20 gallon fish tanks, which would allow you to stock up on more fish and would be slightly easier to maintain. We didn’t like: The tall design isn’t ideal for certain fish species. 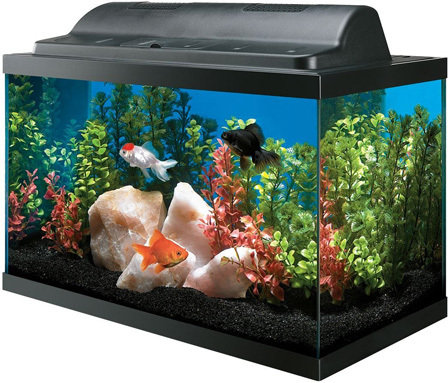 If you’re tired of the rectangular design that most 10 gallon tanks have, you’ll enjoy Tetra’s half moon aquarium. Its unique crescent shape allows an unobstructed view, while the small base ensures easy placement. The transparent lid is a nice addition, as it allows you to admire your fish from above as well. This fish tank comes with LED lights, an aquarium filter and a 50W heater. All things considered, the included supplies are of decent quality. The filter has enough power to ensure crystal clear water – but doesn’t appear to be too noisy. Unfortunately, the tall design of this aquarium isn’t ideal for some fish species that need more swimming room – like Neon Tetras or Rasboras. On the upside, it allows live plants to grow taller. We liked: Beautiful, seamless front design. We didn’t like: Lid appears somewhat flimsy and cheap. 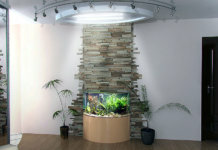 We loved the seamless, modern look of this fish tank. 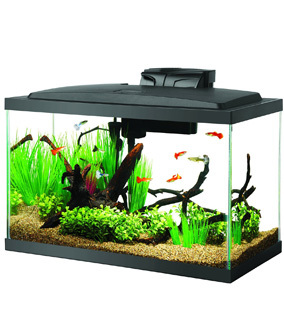 The rimless front makes it an excellent tank for aquascaping, or keeping live plants, and makes cleaning slightly easier. Like all other 10 gallon tanks from this review, the Penn Plax aquarium is sold as a kit, including some necessary supplies that you’ll need to get started. The filter seems decent and is able to handle the capacity of this tank just fine. Unfortunately, we found the included lighting to be somewhat weak. If you’re planning to use this as a planted tank, you may have to invest in better lighting. The biggest problem we had with this 10 gallon fish tank is its lid; it looks flimsy and cheap on an aquarium with an otherwise impeccable design. We liked: Good value. Great if you already own the necessary equipment. We didn’t like: Doesn’t include most necessary aquarium supplies. A good choice if you already own a filter, and don’t want to pay for an “all-in-one” kit. This tank doesn’t include all the necessary aquarium supplies; you’ll need a filter – and may need a heater (depending on the type of fish that you want to keep). Despite this, it’s an economical solution which you can customize with quality supplies of your choice. As far as the construction goes, we found that the glass is sturdy and well-assembled. 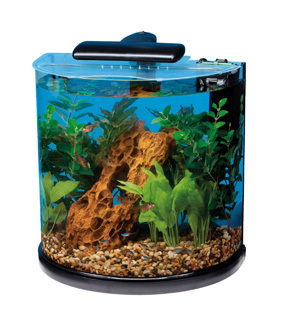 This 10 gallon fish tank is around 20″ wide, allowing plenty of swimming room for your fish. What kind of fish can I keep in a 10 gallon fish tank? A 10 gallon fish tank is great because it’s the first size that takes you out of the “limited” zone and greatly expands your options on the type of freshwater fish that you can keep. 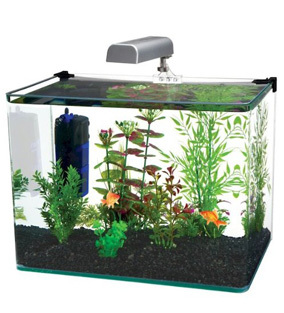 A 10 gallon can safely house 10 – 12 Neon Tetras or 2 Dwarf Gouramis; you can also keep Guppies, Platties, White Clouds, Harlequin Rasboras, and, of course, the Betta Fish. When stocking, be mindful of the 1″ per gallon rule – meaning that you can keep up to 10 inch-long fish in a 10 gallon, 20 in a 20 gallon tank, etc. Of course, this only applies to the size of the adult fish. For instance, Pleco fish are usually when they’re about an inch long. But they can grow up well over 10″, and require a 55 gallon fish tank or larger.